Unless you know someone in Nashville or live nearby, you may not have heard about what’s going on here in Middle Tennessee. You’ve probably heard a lot about the failed car-bomb in Times Square because, well, that’s New York, and anything that happens in New York must dominate the news cycle. I know you’ve heard about the devastation of the oil spill in the Gulf of Mexico, one of the worst eco disasters we’ve seen. Yes, I’m concerned about that, too. And I know you’ve seen news coverage of the protests against Arizona’s new anti-immigration law. 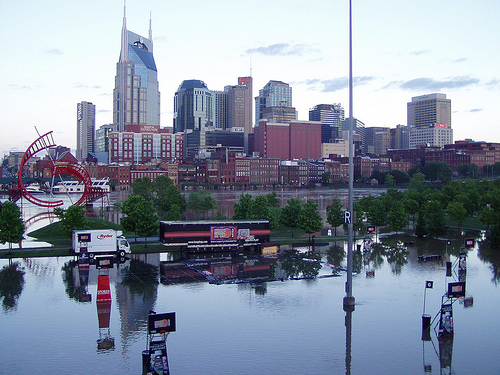 And you may have heard a thirty second sound bite about “flash flooding in Nashville” and not thought much about it. A large part of the reason that we are being ignored is because of who we are. Think about that for just a second. Did you hear about looting? Did you hear about crime sprees? No…you didn’t. You heard about people pulling their neighbors off of rooftops. You saw a group of people trying to move two horses to higher ground. No…we didn’t loot. 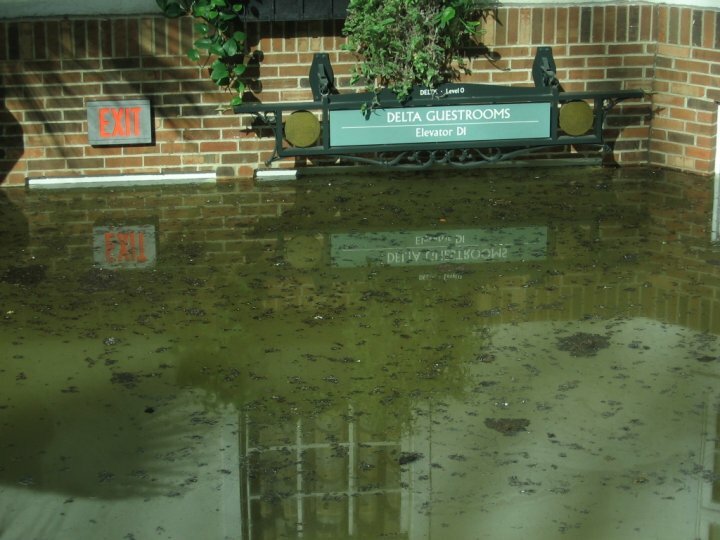 Our biggest warning was, “Don’t play in the floodwater.” When you think about it…that speaks a lot for our city. A large portion of why we were being ignored was that we weren’t doing anything to draw attention to ourselves. We were handling it on our own. Now that it’s been several days and word is starting to get out, we’re starting to get a little more coverage nationally. Thankfully, my impatience for once worked in my favor and I climbed out of dead-stopped traffic about half a mile south of this and took surface streets home—not learning about this until I got home and turned the TV on. And here’s a slideshow from The Tennessean of more images of the hardest-hit areas. 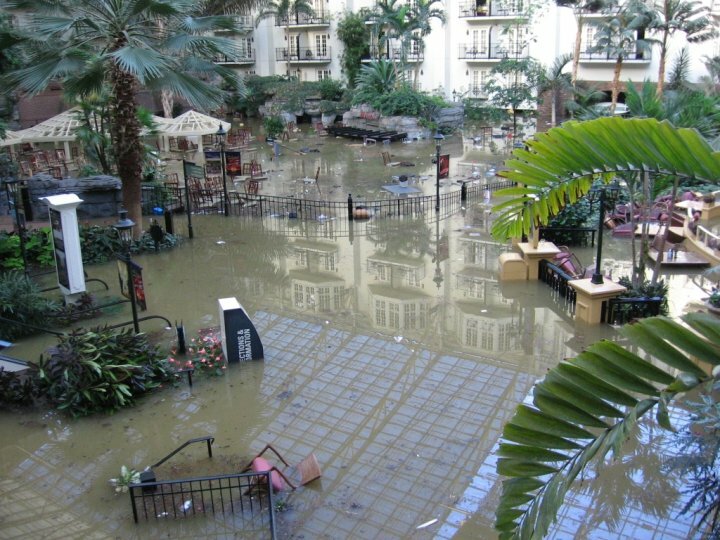 The Romance Writers of American conference, which was scheduled to be held at the Opryland Hotel at the end of July, will now have to be held elsewhere—in another city—due to the devastation at the hotel. Oh, yeah, that’s right. 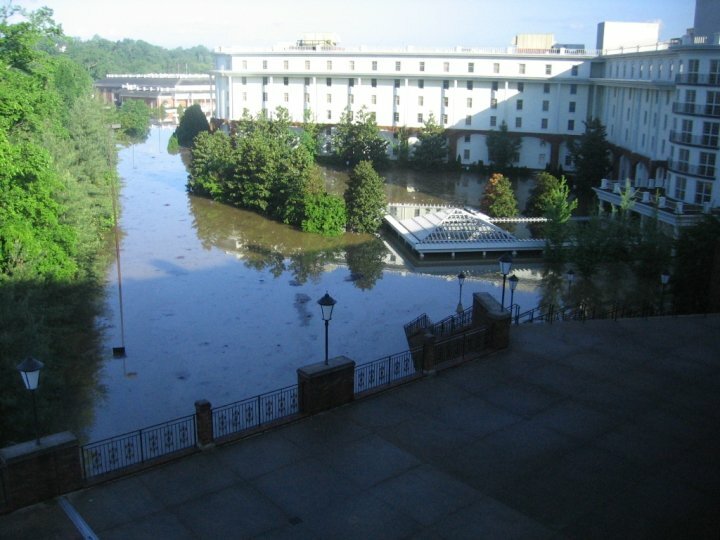 The hotel’s being flooded (and not expected to re-open before December), along with the Grand Ole Opry House (the shows will move to the Ryman in downtown), Country Music Hall of Fame, and most of the tourist haunts in downtown, means millions of dollars lost to Middle Tennessee—from tourism and travel, our largest “industry.” And I haven’t even gotten into the devastation of lives (at least 22 dead, hundreds unaccounted for across the Southeast) and personal property. This will probably be one of the most iconic pieces of film to come out of this disaster. Be sure to watch the whole video. This is why they tell you not to go into flash-flooded areas because you don’t know (a) how deep it is and (b) how strong the current is. You don’t have to search very hard to find images of the devastating flooding across Middle Tennessee. One of the reasons those of us who live here are so concerned with the lack of national coverage of this disaster is because the money to recover from it is going to have to come from somewhere. But without the constant attention disasters like the tornado in Yazoo City got or the oil spill in the Gulf is getting, the volunteers to help with recovery efforts as well as the financial support we’re going to need to recover aren’t going to come. And since I can’t possibly list all of the local churches and businesses that are helping out, here’s a great list from the Nashville Business Journal. Or donate to any of the above listed outreach organizations/churches. Most of all, please pray for those who have lost everything—their homes, their belongings, and their livelihoods. This is not going to be easy to recover from. But they don’t call this the Volunteer State for nothin’. And the outpouring of help and support from those in Middle Tennessee to help our neighbors before the rains had even ended just goes to show the spirit of the people who call ourselves Tennesseans. We just ask to not be forgotten or overlooked. Please post on Twitter, Facebook, or your own blog information on how to help with relief efforts (or a link to this blog post) to spread the word about the needs in Nashville. It is a disaster. Thank you for posting and reminding us as it is not nationally being covered as the disaster that it is. Are you ok? 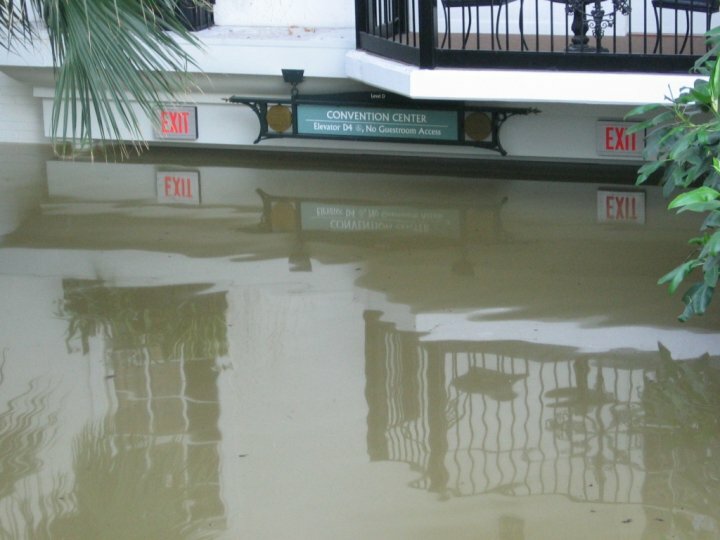 My area of town (Woodbine) is fine–no flooding at all due to being “high ground.” However, we are only a few miles north of the flooding on I-24 (the video of the building above), which I almost got caught in coming back from my book signing Saturday. I sat in dead-stopped traffic about 45 minutes before forcing my way over to the exit to get off the interstate—just one exit down from where that flooding was! I do have friends who’ve been evacuated from their homes in other areas, though, so I know they’d appreciate your prayers! Kaye, Praying for all of you! Kaye, I’m glad that you are doing ok! I have only heard so much about this, mostly from you. I hope that the Federal funding does come through! I have a friend who has friends near Nashville – Hartsville – do you happen to know what the damage is like there? It’s just indescribable… I’ve talked to so many people remotely and heard, “Oh, I knew there was a lot of rain there but…” Thankfully we fared well down south… well Franklin didn’t, but Spring Hill did, although there are many people cleaning out their ruined floors… but I think I speak for us all that we’ll take the little damage over the catastrophic damage others are facing. My heart absolutely breaks for those who lost everything and those still missing, or those with missing loved ones. Kaye, you know you’ve had prayers going up from Kentucky. We’ve probably had a little more coverage than a lot of the country, since we consider Nashville in our “neighborhood.” My sister has a friend in Nashville, not flooded yet, but her car is packed, and the news teams are using her front yard as their staging ground. They’re that close to the water. When they opened the locks at Barkley Dam on the Cumberland, it started rising water levels here in Western KY with no warning, flooding people living in low-lying areas along the river. Was in Paducah this afternoon, and the water is WAY up, but they haven’t closed the flood gates yet. Stay safe, Kaye, and know that we’re praying for you and your neighbors! The videos and pictures are just remarkable. It is so sad to see all of this destruction and hear of all the loss. I’m glad you are safe and sound and am praying for all involved. West Tennesse is flooded pretty badly, too. Don’t forget to say a prayer for the people who’ve been affected farther west. My prayers go out to the people of Tennessee. I don’t think the situation’s been forgotten or overlooked. I’ve been hearing about the flooding every day since the storms began. But I hadn’t seen pictures, and I was wondering about that just this morning (partly because I listen to radio or go online for news more than I watch TV). The descriptions made it sound a lot like Katrina in New Orleans so I kept wondering, Where are the pictures? Not that we need pictures when someone is in trouble, but nothing sticks in the mind’s eye like a visual. Thanks for sharing, and I’m glad you’re ok. I did not hear of this disaster until my son called us Monday night. I couldn’t believe it. We live in Kansas and had a busy weekend without listening to the TV or radio news. We had no idea! Our son lives in the Green Hills area of Nashville. Many of their neighbors were flooded, especially in basements. 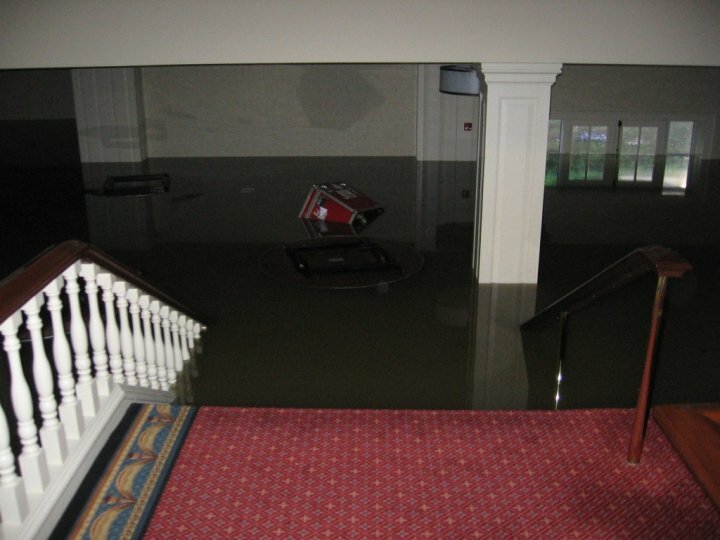 They had a great sump pump that kept them getting only about 2 inches of water in their basement. Your site is the most informative I’ve seen. Thanks for sharing all this! I was finally able to get in touch with one of my dear friends, Georgina, who lives in the Opryland area–not too far across Briley Parkway from the hotel, in fact. Their entire neighborhood was evacuated BY BOAT Sunday evening (fortunately, they’d taken one of their cars to higher ground earlier in the day) and are now staying in a house a friend of theirs was trying to sell. They’ve been told it’s going to be a couple of weeks before they’ll be able to live in their house again . . . assuming the insurance adjustor comes this week or early next week to assess the damage—which has to be done before the cleanup can begin.